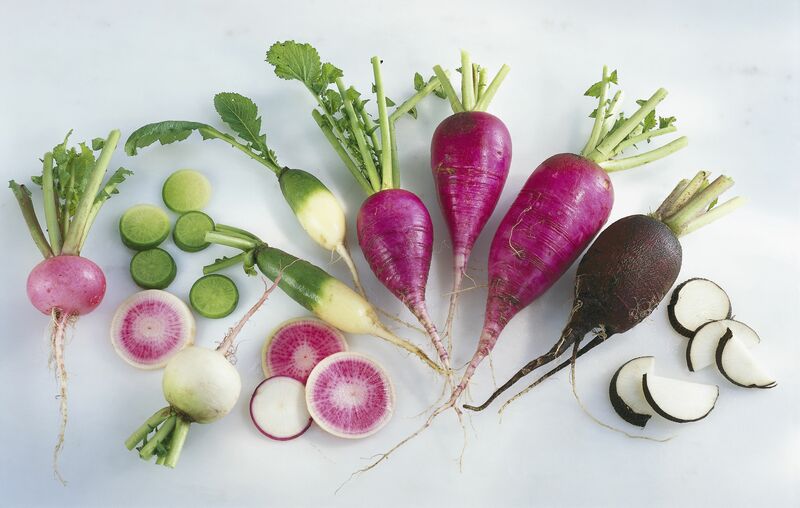 Radishes come in many shapes and sizes—from small classically red round radishes with leafy green tops to the gnarled brown root of horseradish, from the increasingly available watermelon radish (green on the outside, bright pink inside), to black Spanish radishes, and fairly common large and mellow-flavored, cream-colored daikon radishes. Learn all about them here. Black radishes (a.k.a. Spanish radishes) have a truly black exterior that covers a snowy white flesh. Black radishes are sharp when raw, and add a nice bite to salads and raw vegetable plates. When sliced paper-thin, they make beautiful garnishes. Scrub these radishes clean in order to keep the brilliant contrast between the black peel and the white interior. Black radishes also make tasty gratins and are delicious when cut into wedges and added to pans of roasted vegetables. Cooking dramatically mellows their sharp edge. Daikon radishes are the most commonly available (and widely known) large radish variety. They are often pickled or dried, but are delicious grated into soups or added to roasted or braised vegetables. They aren't usually eaten raw but can be bright, crispy delights when peeled and cut into very thin slices. French radishes are slightly elongated versions of round radishes. They tend to have a milder flavor than the round versions, but, like all radishes, their level of sharp bite varies tremendously. Yes, horseradish is, indeed, a type of radish. If you've only ever had jarred horseradish you need to give yourself a treat and try the real stuff. Bright and pungent, without the bitter aftertaste sometimes found in jarred versions, fresh horseradish perks up any meal and is especially good with the heavier roasts and stews of cold weather cooking, which works out nicely since it's harvested in the fall and stores well over the winter. These are what pop to most people's minds when they think "radish." The most common variety is red, but they also come in shades from white to pink to purple. When sold in a mixed bunch they are often marketed as "Easter radishes" for their resemblance to dyed Easter eggs. Serve these bright, crunchy delights all on their own, with a bit of butter and salt as the French like, or sliced and tossed into salads. Watermelon radishes are so-named for an obvious reason to anyone who has ever cut into their green skin and seen their brilliant red-pink interior: the similarity to a watermelon is stunning. Scrub them clean, cut them into wedges, and serve them as a sharp and beautiful crudité or cut into thin sticks to add to salads. Cooking these beauties is a waste​ since their distinctive color softens along with their bright flavor.